It is not always easy to figure out what house plan is best for you. Many people get confused and miss out on key elements that must be considered when designing a good house plan. It is therefore crucial to engage the services of a qualified architect to help you conceptualize and design your dream home. There are several things you need to consider as you select a house plan that will work for you. Keep these points in mind. The first and most important thing you must do is find out is the construction regulation in your county. Each county has different regulations, which differ greatly from county to county. These regulations affect setbacks, zoning, access, parking, road reserve, plot coverage, plot ratio. Plot setback refers to the amount of space that is required between the boundary of your property and the house. Some counties require up to 6 meters plot setback in addition to 1.5 meters road surrender. Plot coverage refers to how much of your land you are allowed to build on. For example some counties stipulate that you can only build on 35% of your property. Plot Ratio refers to the size of your house in comparison to the size of your property. For example some counties stipulate that the maximum size of your house should be 1.5 times the area of your property. The prospect of becoming a home owner is very exciting. Many people get over excited and select house plans that exceed their budget. Keep your budget in mind when selecting a house plan. 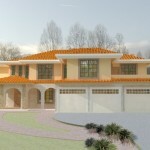 There are many simple house plans in Kenya that you can choose from. Do not frustrate yourself by selecting a house design that you cannot afford. You do not want to start making alterations in the middle of construction and even worse, cutting corners. You also do not want to end up with a huge house that is poorly finished. In most cases, you will find that the extra space you desired is not even necessary and ends up being wasted or under utilized. Don’t forget to factor in all the costs including the cost of professional services and the cost of getting approvals by the relevant government bodies. It is also important to think about how you currently live your life from day to day and how your future life will look like. The needs of a single person are very different from the needs of a married person. The number of dependents you have as well as their ages will also determine a lot. Take all these factors into consideration and your decision making with be much easier. Remember that all these factors keep changing and you need to build a home that not only works today but also in the future. Another factor that needs special consideration in the needs of your family members. If you have any member who is physically challenged then their needs must be top of the list as you make your choices. Their comfort must come first. Also ask yourself, “Will I enjoy taking stairs to my bedroom when I am older or should I have my bedroom at the lower level?” The choice to build a bungalow or a multiple story building is very key here. Enjoy the journey of finding the right house plan for your family. Be patient and be flexible. Do not over look the need to hire a professional to help you find the right house plan in Kenya. Remember, your home is a big investment. Don’t skimp on getting the right house plan because that cost is just a small fraction of what you will spend on the overall home. Once you have the right house plan, you are well on your way to become a proud home owner.